Introduction: As the field of minimally invasive surgery has matured, a trend has developed toward fewer and smaller incisions. As laparoscopic techniques and equipment have advanced, surgeons have continued to reduce the surgical footprint with regard to cosmesis and tissue trauma. 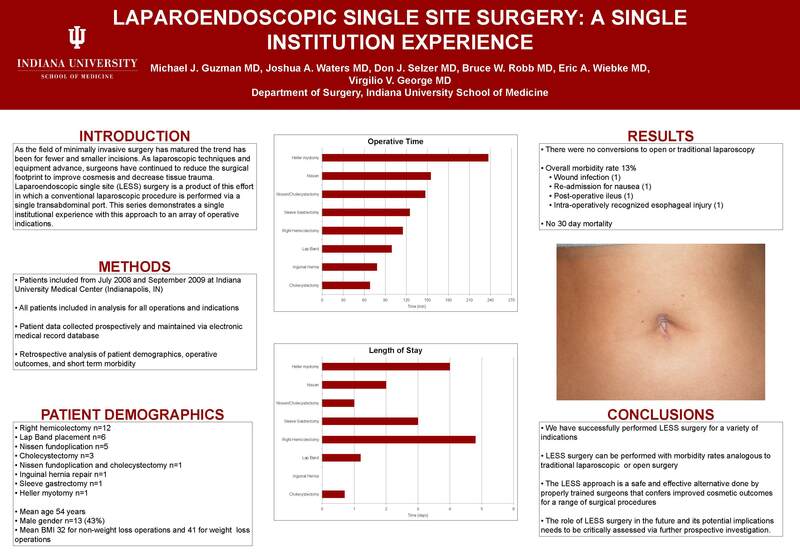 Laparoendoscopic single site (LESS) surgery is a product of this effort in which a conventional laparoscopic procedure is performed via a single transabdominal port. This series demonstrates a single institutional experience with this approach to an array of operative indications. Methods and Procedures: This is a retrospective analysis of prospectively gathered data regarding 30 patients who underwent LESS surgery for any indication at one group’s multi-hospital institution between July 2008 and September 2009. Data regarding patient demographics, operative outcomes, and post-operative morbidity were analyzed. Results: Operations performed included right hemicolectomy (12), lap band placement (6), Nissen fundoplication (5), cholecystectomy (3), combined Nissen fundoplication and cholecystectomy (1), inguinal hernia repair (1), sleeve gastrectomy (1), and Heller myotomy (1). Mean BMI for those undergoing weight loss surgery was 41 and for non-weight loss surgery was 32. Mean operative time for right hemicolectomy was 115 min (71 – 266min), for lap band was 99 min (69 – 125min), for Nissen fundoplication was 155 min (100 – 236min), for cholecystectomy was 68 min (60 – 80min), for combined Nissen and cholecystectomy was 147 min, for inguinal hernia repair was 78 min, for sleeve gastrectomy was 125 min, and for Heller myotomy was 237min. Mean length of stay was 4.8 days (2 – 10days), 1.2 days (1 – 2days), 2 days (1 – 4days), 0.7 days (0 – 1days), 1 day, 0 days, 3 days, and 4 days respectively. There were no conversions to open or traditional laparoscopy. Overall complication rate was 13%, which included wound infection (1), readmission for nausea (1), post-operative ileus (1), and intra-operatively recognized esophageal injury. There was no 30 day mortality. Conclusions: LESS surgery is a feasible option for select patients. We have successfully performed LESS surgery for a variety of indications without need for conversion to a traditional laparoscopic or open approach. In addition, these procedures were performed with analogous morbidity and no mortality at 30 days. In this experience, the LESS approach is a safe and effective alternative that confers improved cosmetic outcomes for a range of surgical procedures. Clearly, the role of LESS surgery and its potential implications needs to be critically assessed via further prospective investigation.